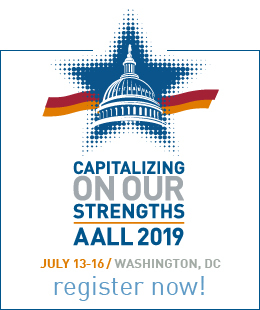 The AALL Executive Board works to champion the legal information profession and our members. They do this by defining AALL’s strategic directions and by creating results through initiatives that support those goals. The Nominations Committee is seeking candidates for the upcoming Executive Board elections. To nominate yourself or an AALL colleague, access the nomination form on AALLNET. Nominations are due by Monday, March 4. This spring, the seven-member committee will present to the membership a slate of candidates for the 2019 election. They will choose two candidates for the position of vice president/president-elect (2020-2021), two candidates for the position of secretary (2020-2023), and four candidates for two open seats on the Executive Board (2020-2023). For the 2019 election, ballots will be distributed electronically in October to all voting members of the Association. 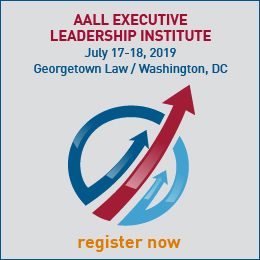 The ballots will be tabulated at AALL Headquarters at the beginning of November, and election results will be announced once the candidates have been notified.